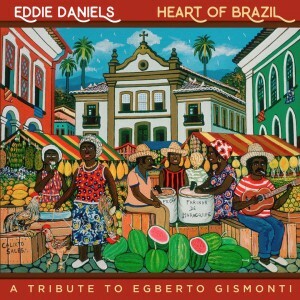 Heart Of Brazil: A Tribute To Egberto Gismonti celebrates a brilliant transformation of the Brazilian polymath’s early music into a heady, seamless suite for octet with veteran clarinetist Eddie Daniels and sizable string contributions from Harlem Quartet. Gismonti’s pre-ECM songs, dances, film and theater pieces (1972–’87) breathe anew here, evoking his dream-travel consciousness, deep dive into world music and tireless excursions into piano and various guitars. Daniels, a whirling dervish and warbling genius, conveys breathless wonderment: His pristine tone and purling conception—links to Artie Shaw—sound as fresh as his 1988 Grammy-winner Memos From Paradise. Like Clark Terry, he bends notes to a precise azure wavelength. In tenor saxophone sallies, Daniels dazzles with cuica-like squeals, Stan Getz-like lemony vibrato and empathetic cries, all unerringly musical. Brisk interaction between ensemble players blends earthbound energy with aspirations of flight. Charts by Ted Nash and Kuno Schmid barely bottle Gismonti’s genies. These twice-told tales span wine-dark seas, tribal magic and nature’s vivid palette, embracing Amazon batuque, Rio samba and carnival frevo. “Lôro (Parrot)” flies featherlight over ostinatos; strings strut and the clarinet leaps for joy on “Baião Malandro (Badass Baião).” “Ciranda (Folk Dance)” unfolds as a keening fairy-ring dance, leading to a frenzied “Folia (Revelry).” A spine-tingling fantasia for drums and col legno strings opens “Maracatú (Sacred Rhythm)”: Daniels sails atop eerie piano octaves and impassioned pizzicati. The front six tracks seethe with a wiry energy, where drummer Maurizio Zottarelli’s elan excels; the second half looms deeply introspective, as pianist Josh Nelson shines in nimble duo (“Tango”) and sets up Daniels’ altissimo portrayal of wrenching homelessness on “Cigana (Gypsy Woman).” Getz’s aura glows brightest on Daniels’ “Tango Nova (New Tango),” as strings invoke Eddie Sauter’s 1960 Focus and Nelson trips the light fantastic. The dreamy “Adágio” leads to rattling horn-string exchanges on “Trem Noturno (Night Train)” and the calm self-possession of young Rembrandt on “Auto-Retrato (Self-Portrait).” More solos—like Daniels and Nelson’s flights on “Chôro”—polish this gem. Kudos to producer George Klabin, who realized a dream to capture Gismonti’s “deeply transportive experiences.” In divisive times, let us rejoice when the best of two worlds meet.